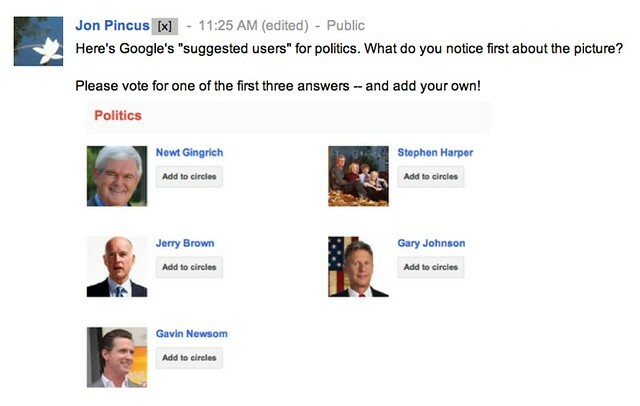 Google Plus launched a “suggested users” list yesterday. I’m not on it, and I bet you aren’t either, particularly if you’re an educator — because, well, there aren’t any educators on the list. The Google Suggested User List reads like the typical San Francisco Bay Area tech firm’s view of the World: most of the “interesting and famous people” are white, and if they’re black, they’re male rappers or athletes. Hello, Snoop Dog, Chamillionaire, 50 Cent, Dwight Howard, and Floyd Mayweather! A couple of weeks go, Google community manager Natalie Villalobos asked for feedback on why people’s friends weren’t staying on G+. One of the things that came up was that it was often very hard for new users to find people the thought would be interesting to follow and engage with. There are a lot of creative ways to approach this, for example Ardith Goodwin’s suggestion of a welcoming committee. Instead, Google+’s decided to take the same approach that worked out spectacularly badly for Twitter two years ago. Will they fare better? The early returns aren’t encouraging. Dave, Robert, and others immediately criticized the idea of a “suggested users” list and Bradley’s outreach to the Twitter elite. After Bradley responded in Dave’s comments, and then shared more details Saturday morning, Robert asked to be removed from the list. Bradley responded again in Robert’s comments. And the discussion rages on. Google VP Vic Gundotra’s comment is from Violet Blue’s discussion of the list. As well as Violet Blue, Google also included prominent nymwars critics Jillian C. York, A.V. Flox, and Xeni Jardin. Congrats to all of them, and kudos to Google for giving visibility to dissenting views. Lynette Young of “Women of Google+” is there too, as are ladyada (aka Limor Fried), Elisa Camahort Page of Blogher, and tech journalists like Sarah Perez and Christina Warren. These are all great signals to send from a diversity perspective. Once again, congrats and kudos. Like Vic says, though, there’s still a ways to go. The suggestions in the politics list are probably the most extreme example of the lack of diversity. They’re all from North American. They’re all native English speakers. They represent a fairly narrow range of the political spectrum. [Yes, even in the US, there’s a lot more perspectives than “Northern California Democrats” and “long-shot secular Republican presidential candidates”.] Oh yeah, and they’re all straight white guys too. Or take the top 22 “picks” — what new users see when they first log in. 15 (68%) of them are guys. The women* are primarily actresses, singers, or in sports and fitness – no writers, photographers, techies, executives, investors … or educators, of course. There aren’t any women of color. The stereotype that the only way to get diversity is through entertainment or sports is an ongoing saga in the view of Blacks in Tech. I hope this doesn’t come across as criticizing anybody who is on the list. I respect what they’ve accomplished. There are some truly inspired choices. But the overall distribution definitely leaves room for improvement. Emotions run high in debates about “suggested followers” lists. Who’s part of the in crowd? Who’s been left out? Two years after Twitter’s suggested user list, Robert still feels resentful about being left off and watching Pete and Mike soar past him. So does Brooks Bayne of #tcot fame. It brings back the worst feelings from high school. 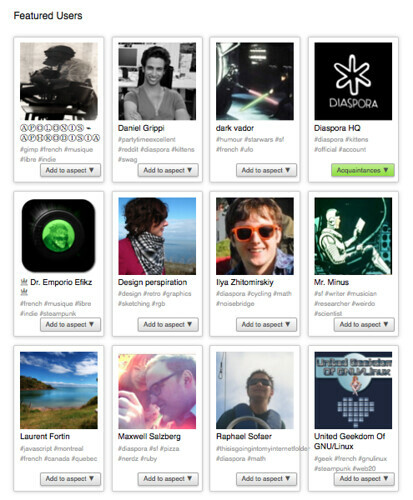 So one reason the suggested users list matters is that it will help shape the feel of the community Google’s creating. As Christina Trapolino points out in What is a community manager, “A real community has to be treated with care and respect. It is a living thing.” Introducing a suggested users list sets up the community so that there’s an in-crowd and an out-crowd. And the in-crowd favors the big names who at the expense of people who are really engaged with the community. Where are emerging Google+ stars like Daria Musk, Lee Allison, Natalie Villalobos, Ryan Estrada, and Christina Trapolino? Instead we’ve got Tom from MySpace, Richard Branson (who didn’t post at all in August), Google biographer Steven Levy (who only posts twice a week or so) and Google founder Sergey Brin. The list sets up a power structure that privileges guys, and where the prominent women and blacks are entertainers. Is this what Vic, Bradley, Joseph, and Eric are talking about when they talk about wanting Google+ to mirror how people interact in the “real world”? We will all now get tens of thousands if not millions of new subscribers to our updates on the network. We will have all the more incentive to keep posting to Plus and to say nice things about it. Those of us who make money doing these sorts of things, as I do when people click my links and view the ads on ReadWriteWeb or consider my consulting services through this site, will probably see a windfall of thousands of dollars. At least. For some new media brands, if Google Plus gets as big as Twitter, it could mean millions of dollars. A huge windfall being doled out by guys, mostly going to guys, none of it for educators, very little of it for women of color … the media benefitting with incentives not to write about it … hey it is a lot like the real world! Of course, it’s still a pilot. To be clear (and per my post) the list was derived algorithmically but was also “bootstrapped” and augmented with people known to be popular on other services (yes, including services like broadcast television.) This algorithmic component is why users with many followers but little activity are often not on the list… and conversely users with much activity and fewer followers did make it. I referred to the curated users as “hypotheses” that we’re testing, and mentioned that if they fail to produce great content “Justice will be served” and they’ll be removed over time. Meanwhile, back on the nymwars front, several of the people on the suggested users list have names that violate the guidelines. It really highlights the inconsistency of Google’s policies: Dj ASHBA and Chamillionaire the Ceo are ok; Doc Popular, Technogran, and Kaliya IdentityWoman aren’t. 50 Cent and Jennifer 8. Lee are cool; M3 Sweatt isn’t. Once again, to quote Vic, there’s still a ways to go. * Paris Hilton, Britney Spears, Dolly Parton, Jessi June, Erin Williams, Taylor Swift, and Erin Richards. Posted by jon on Sunday, September 4th, 2011, at 12:34 pm, and filed under Professional, social sciences, Tales from the Net. Also posted on Google+. Feel free to jump in there or here! Somebody explain that to me, please, because it MAKES NO SENSE WHATSOEVER. You were way to nice about this whole thing. Google has essentially has gamed its own system – as one commenter put it on a post I made about this “they cheated”. The additions of Violet Blue and Jillian York to the “cool people list” were transparent bribe attempts. Violet seemed to pick up on that, Jillian did not, even though she is the one that should have been trained to recognize such things – and I really lost a great deal of respect for the EFF as a result. This was a really pathetic thing for Google to do. They had already lost a great deal of the trust they have built up over the years when they started killing profiles, and now they are even losing their reputation for fairness. Rob, if Google is trying to use the suggested users list to try to drive a wedge between people who support pseudonymity, you’re certainly playing into their hands with your attacks on Jillian. On the “Picks” list — the one that all the new people signing up see by default — they’ve now got +will.i.am . and +Trey Songz instead of +Chamillionaire The Ceo and +50 Cent. +Tyra Banks has replaced +Taylor Swift And +Guy Kawasaki has replaced +Robert Scoble. No change to the overall pattern: overwhelmingly male, the only blacks are musicians, almost all the women are musicians and actors. And the “politicians” page is down to four (Newt’s gone) … but they’re still all white guys. Still a ways to go, indeed. Six months later, it’s still all guys in the Politics section of the Suggested Users List. But at least Barack Obama is there, so it’s not all-white! The “picks” category has 23 guys (including Robert Scoble!) and eight women: Britney, Madonna, Lady Gaga, Kim Kardashian, Jeri Ryan, Ashley Tisdale, Felicia Day, Maria Bartiromo. To illustrate just how vast the discrepancy is between those on the SUL and those who aren’t I did some math based on information I found on Social Statistics: http://goo.gl/TMdSa. For the average interactive user with a follower count between 30,000-100,000 who’s not on the SUL they go up on average by 201.4 followers a day and at this rate it would take 7.18 years to hit what is currently the 200th most followed position of 550,441 followers, 10.7 years to hit the 100th position with 795,008, and 29.0 years to hit the top position of +Britney Spears with 2,076,254 followers. The average account that has been on the G+ Suggested User List constantly for the past 31 days goes up by 8,739.6 followers a day, that’s 44.4 times as many per day on average than those not on the list. So there obviously appears to be a large discrepancy in the number of followers one is able to obtain between being on the SUL or not. Milos Janata has a nice visualization. As an independent content creator trying to find my place in this space and trying to make a living from it, I am at a critical disadvantage from the people that Google has chosen. I have had in-depth conversations with +Eric Rice, +Chris Pirillo, +Robert Anderson, +Hermine Ngnomire, +matthew rappaport, +Bruce Garber, +Paul Roustan and countless others surrounding this topic. The general consensus is that Google is taking what should be a fair playing field and picking favorites. I think Google was naive in doing this, because they may have not taken into consideration the amount of impact, influence and–potentially–money that they were throwing in the lap of people that they have chosen to recommend. So … still a ways to go. These days the suggestions about who to follow are mostly organizations. Their are still some people. Of the 60 recommendation in Politics, I think there are 10 people: Senators Rand Paul, Harry Reid and Bernie Sanders; Congressmen Xavier Beccera, Stephen Fincher, Mike Honda, and Ron Paul; Stephen Harper, of course; and Governors Scott Walker, Sean Parnell, and … Gina Raimondo! So, only 90% guys!